The phrase “no hoof no horse” suggests that horses need healthy feet in order to survive. I think the phrase understates the rich complexity of the equine pump that pushes blood from the hoof up the cannon bone, and back to the heart (it is also said that a horse has five hearts). As a horse owner, hoof care practitioner, and visual artist, proper trimming of the equine hoof interests me. 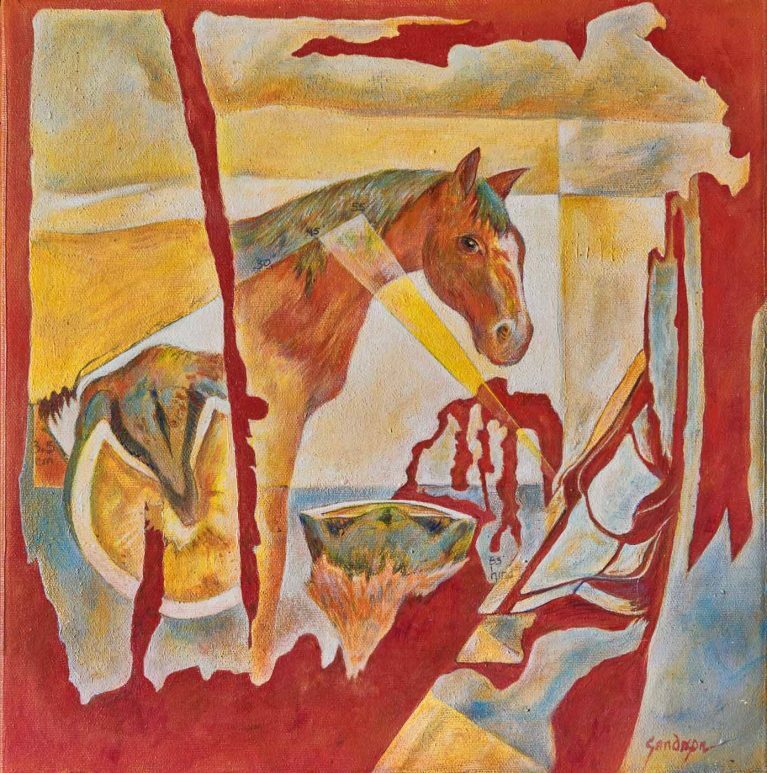 “No Hoof, No Horse”, a 12 X 12” acrylic painting on canvas is intended to illustrate several points explained in the The Hoofcare Specialist’s Handbook: Hoof Orthopaedics and Holistic Lameness Rehabilitation by Hiltrud Strasser, DVM, and Sabine Kells (Qualicum Beach, British Columbia, 2000). This master text featuring Strasser’s research on the causes of equine hoof pathology and correct hoof trimming has heralded a major shift in thinking about conventional farriery. Strasser and Kells’ work provides physiological, anatomical and technical information, including methods and procedures for equine hoof care, and has informed notable leaders in the natural barefoot trim movement on this continent. The truly interested student in this subject will want to read this book but few copies will be found on home bookshelves because of it’s limited edition. The challenge of creating an illustration has caused me to think differently about peripheral edges as well as non-traditional depth of focus within a painting. Perhaps I shall return to this approach again as I like the freedom of two-dimensionality that it offers. If you would like to view more of my acrylic art, visit my acrylic gallery.